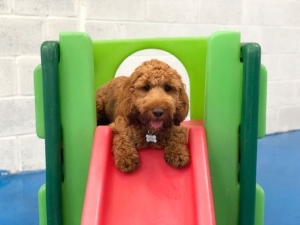 EveryDog is Kent’s first fully licensed and fully insured open-play dog crèche of it’s kind, offering a great alternative to kennels, doggy day care and dog walkers. Drop your pooch off for a day full of fun off-the-lead play with other dogs in our safe, secure dog-friendly facilities. 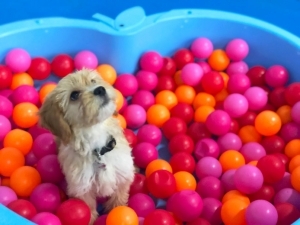 Dog Crèche’s have many similarities to a child’s nursery and, unlike kennels, gives every dog the opportunity to be free to run around, sniff, socialise and do all the things that they were built to do! 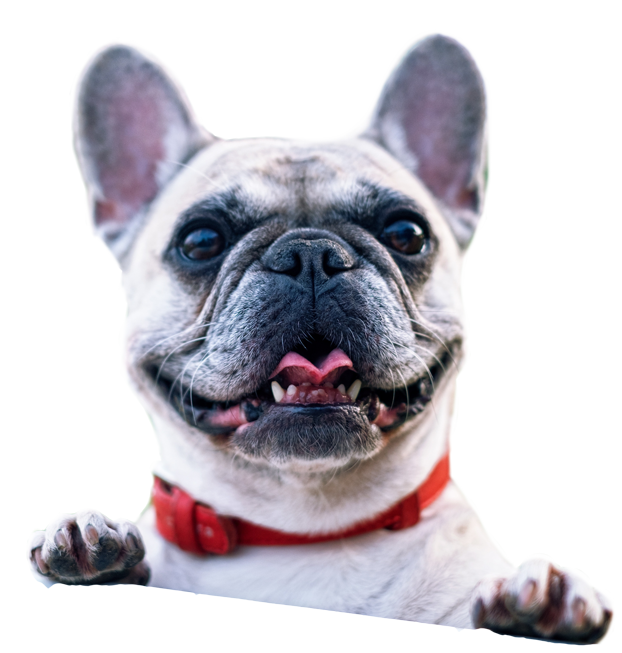 That is why you will not see a single cage in sight at EveryDog, our open-play model has proved integral to improving a dog’s behaviour, long term. 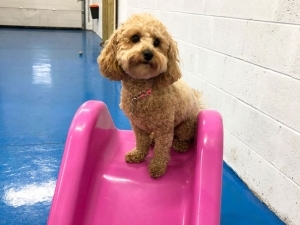 The difference between a Dog Creche and Doggy Day Care is that we have a team of well-trained and experienced staff who are one hand to ensure a safe and fun day is had by all! Our strict ratios of dogs per human means that our team are able to give plenty of attention to each and every dog, taking the time to keep them entertained and stimulated and (most importantly) safe. A dog walker might only take your dog out for a 20 minute in the middle of the day but a dog creche gives them a whole day of exercise and socialisation. Our stunning facility is split into 2 spaces so that high-energy dogs can play together, whilst giving our calmer, older dogs and puppies each their own space. Each room even has plenty time to enjoy our beautiful, secure outside area. Each space is filled with age appropriate toys & games and is overseen by our fabulously dog-friendly team. Your dog can engage in day-long games and enrichment as well as many other fun activities – including scent destruction boxes, paw printing and much more. Our team of trained carers will ensure each dog has ample time to play, learn and rest according to an industry-proven daily schedule. Studies show that this kind of off-the-lead play with other dogs helps to keep them happy and will often even improve their social skills and behaviour! With EveryDog, your pooch can learn through socialisation and play in a safe, secure environment and, best of all, they’ll have a great time doing it! Still need a little extra convincing? 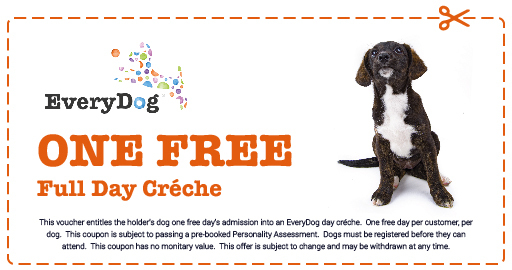 Why not try before you buy with this coupon for a FREE Full Day in our crèche! Simply click on the coupon below and show the PDF to a member of staff when you book. All dogs must have a Personality Assessment before they can register with any of our creches. This is a process to ensure a safe environment for all our pooches and will only usually take 10 to 15 minutes. Most dogs pass first time with flying colours but, if we have any doubts about the safety of our other pooches, we can fail a dog. If this is the case for you, we will always work with you, offering advice and support to help improve your dog’s behaviour before a retest in 6 weeks. We assess dogs 10am – 4pm Monday – Friday and 10am – 4pm on Saturdays so get in touch now to book your pooch in for their assessment! Prepaid days will be added as credit to your account – they do not need to be used in consecutive days and there is no expiry date. EveryDog creches have been built with you in mind. Whether you are a commuter or a local, our facilities couldn’t be easier or quicker to reach; and with our unique drop off and collection hours you can pop in on your commute to and from work! We are placed just 5 minutes from Junction 4 of the M20 and 10 minutes from Junction 2 of the M2, reaching us couldn’t be quicker or easier! Oh, boy – I know where we are! I always get such a warm welcome from the super-friendly receptionists! It's time for my owner to leave now, but that's okay – I'm off to find my friends in the playrooms! After a “good morning” sniff here and a "nice to see you" lick there, everyone has said hello and we're ready for a day full of fun! How exciting! There's more than enough toys and activities to go around and our carers are keeping us busy with lots of games. Maybe I fancy a bit of fetch today. Or maybe a game of Tug of War. Jamie is caring for me today and he always gives me a run for my money (but don't worry, I always win!). I love this part of the day! It gives me a chance to exercise my brain, improve some skills and even learn new ones! Phew! After all that exercise, I'm ready for a nap. The tempo of the room is lowered as the music is switched to classical and we all head to the sofas (including our carers) to resume a lounge position. After that nap, I'm ready to show off my skills to the other dogs and take a lap or two through the agility course – it’s all great exercise! Of course, agility isn't for everyone, other dogs are just happier chilling on the sidelines, watching or playing with one of the many toys! What's that Jamie is bringing out now? What's that smell? Oh boy! Scent destruction boxes! I love these, they keep us entertained for ages. I have to sniff and chew my way through several layers of boxes to get all the treats! It's so much fun! Wow! Another power nap wouldn't go amiss right now, just a quick recharge of my batteries. Oh, yay! The sun is shining today and it's our playroom's turn to head outside to make the most of it in the garden area; and there are even more toys and games outside! After all that fun, the day is almost over. My owner will be here any minute but there's still time for some last minute fun and games! My name is being called which must mean my owner is here now; a few goodbye kisses to my friends before Jamie takes me back to them. He has a quick chat with my owner, letting them know what I've gotten up to today and what new skills I've been working on. Off we go! I can't wait until the next time but, for now, all I want to do is sleep!